Review: A group of interrelated characters who are in search of love, forgiveness and also the meaning of the San Fernando Valley. The cast is just superb but the standout performance in this is Tom Cruise who gives it everything he has got. Some of the stories in this are very compelling and some sad. It also deals with the loss of life. It is alive and free and has so many surprises. This film is about a dark and bitter poetry of regret. The main theme is about the cruelty to children, and its lasting effect. The music in this is fantastic, especially in the first 10-15 minutes of the film. It is a fascinating film to watch. Just like most of Paul Thomas Anderson films this runs well over the 2 hours (3 hours and 8 minutes to be precise). He has just recently admitted that he finds the film far too long now and admits that he would have cut some of the story lines from the finished product. 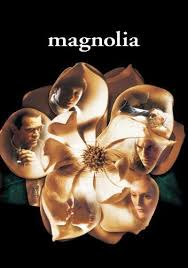 In this film almost every location contains at least one picture or painting of a magnolia. Apparently when this came out there were reported walkouts. You can look at this film on two different levels. One where the stories are to do with real life and are therefore filled with detail and humour. Or you can look at it as a parable, with a hidden meaning. At the Golden Globe Awards in 2000 this won Best Performance by an Actor in a Supporting Role in a Motion Picture (Tom Cruise).